Markings: The import mark under the barrel is in small text next to the front sight band. It reads “INTRAC / KNOX TN”. The top of the receiver is marked “U.S. CARBINE / CAL. 30 M1” on the front and “INLAND DIV. / 5130291” on the rear. The bottom of the receiver is marked “4”. The top of the barrel is marked “INLAND MFG. DIV. / GENERAL MOTORS / 3 – 44” and “P”. The barrel flat is marked with serial inspection stamps. The left rear of the trigger group is marked “INLAND” which is an Inland mark (page 78 of Craig Riesch’s book, U.S. M1 Carbines Wartime Production 7th Edition). The hammer is marked “I.K” which is an Inland mark (page 89). The magazine release is marked “M” and “W-I” which is appears to be an Inland mark (page 100). The rotary safety is marked “S in a circle” which is a post WWII replacement mark (pages 95 & 184). The inside of the operating slide is marked “.U. in a circle” which is an Underwood mark (page 65); the bottom is marked with a part number. The bolt is marked “A.I.” on the left lug which is an Inland mark (page 36). The front sight is marked “.U.” which is an Underwood mark (page 56). The Type I rear sight is marked “S” which is marked on all Type I sights (pages 27). The Type IA barrel band is unmarked which is consistent with Inland and others (page 59). The sling well is marked “W” which is a Winchester mark (page 108-109). The inside of the handguard marked “OI” which is an Inland mark (page 138). The base of the grip is stamped “105”. The top left of the receiver is marked “BAVARIA RURAL POLICE”. This is an American Occupied zone (West Germany) marking. For information and a photo of the Bavarian marks see pages 191-192 of Craig Riesch’s book, U.S. M1 Carbines Wartime Production 7th Edition. The sling well, the inside of the handguard, the top rear of the trigger housing and the top of the bolt (stamped; possibly force matched) are all stamped “0291”. These are post WWII Austrian markings that match the last 4 digits of the rifle’s original U.S. serial number. The bottom of the trigger guard is marked “LGK Sb / 0010”. This is a post WWII Austrian marking. The “LGK” portion stands for Landes Gendarmerie Kommando (Gendarmerie Command for the Land of) and the “Sb” portion stands for Salzburg (the land or province where it was assigned). The left side of the operating slide is stamped “7378”; this appears to be a USGI replacement part issued in Austria. Sights / Optics: The front sight is a post set between two protective wings. The rear sight is Type I flip up, dual aperture assembly. Stock Configuration & Condition: The stock has a pistol grip, metal barrel band with sling loop, sling well, sling pass through and a metal buttplate. The refinished buttplate has small scratches, small dents and a few spots of surface erosion showing through the finish. The top of the grip shows a small hairline crack at the recoil plate. The wood shows numerous scrapes, scratches and compression marks which have been oiled over. Many have damaged small portions of the finish or surface wood. The LOP measures 13 1/4 inches from the front of the trigger to the back of the buttplate. The stock rates in about Very Good Plus overall condition. Bore Condition: The bore is semi bright, light grey the muzzle. The rifling is crisp. There is light erosion at the muzzle. The bore shows an M.E. of 1.8. Overall Condition: This rifle retains about 97% of its metal finish. The barrel shows scrapes. The right side of the receiver shows thinning consistent with cycling. The metal shows other light scrapes & handling marks. The screw heads are intact. The markings are deep. Overall, this rifle rates in about Very Good Plus to Fine condition. Box, Paperwork & Accessories: None. Please note, this rifle does not come with a magazine. Our Assessment: This Rare Inland M1 Carbine was made by the Inland Manufacturing Division of General Motors during WWII. After WWII it was issued to the Bavarian Rural Police in the American Occupied Zone of Germany (later West Germany). It is marked “Bavaria Rural Police” on top of the receiver. It is one of only 5,456 M1 Carbines issued to the Bavarian Rural Police. Beginning in 1953 the Bavarians sold off many of these M1 Carbines and the Bavarian markings were removed from many of the Carbines sold. 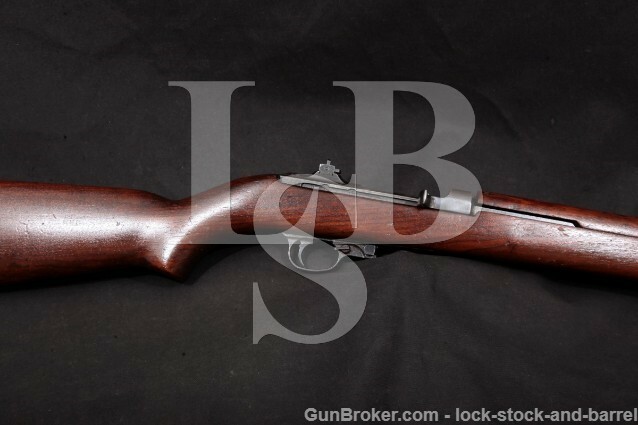 Eventually this M1 Carbine was sold to Austria and issued to the Gendarmerie. It kept its Bavarian markings and was given new markings by the by the Austrians. This Rare M1 Carbine. It has lots of markings that tell a story that add to its historical value. This is an Ideal M1 for the Collector.